The pay stubs for teachers in these districts, such as the Washington Elementary and Tempe Union school districts, will look drastically different next school year. Some individual teachers will see pay bumps as high as nearly 20 percent. That’s far more than Ducey’s three-year plan that calls for 10 percent pay hikes in the coming school year and 5 percent the following two years. “And I’m pretty old, I can remember a few years back,” Essigs said. But Essigs and other school officials and public-education advocates note the raises and new state education funding do not entirely restore the $1 billion in cuts to education funding following the recession. 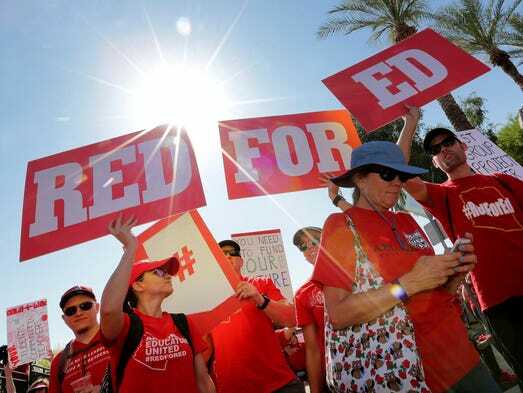 Leaders of Arizona Educators United, the teacher-led group that coordinated the statewide, six-day #RedForEd teacher walkout that ended May 4, claimed a partial victory with the budget, but most of the funding demands they announced in late March have not been met. Many school boards are still internally debating their budgets and have not yet publicly unveiled any proposals. School boards have the final say over how the new money will be spent, and are expected to make their decisions by the end of June. Here is what we know so far about how schools plan to spend the new funding. Yes, nearly all of the 46 Arizona school districts tallied by The Arizona Republic that have announced proposals call for giving teachers average raises that are upwards of 10 percent next school year. However, the actual dollar amounts for teachers, as well as the rate of the pay bumps teachers should expect, vary widely across the state. For instance, several districts have raised their starting salaries and plan to give bigger increases to more experienced educators who went without pay raises for several years. In Washington Elementary School District, for example, a 25-year teacher with a master’s degree will make $60,822 in the 2018-19 school year after making $50,412 this year, according to Justin Wing, the district’s human resources director. The raise for this level of teacher amounts to just over 20 percent. Tempe Union High School District plans to give teachers a $7,549 pay increase across the board next school year that would amount to increases ranging from 10 to 19.56 percent, depending on the teacher’s salary. Some districts, such as Yuma Elementary School District, plan to give teachers raises ranging between 10 to 11 percent, depending on teachers’ experience. Newer teachers will receive less. A fourth-year Yuma Elementary teacher posted his new salary of $34,700, including the 10 percent pay increase, on the closed Arizona Educators United Facebook group. The teacher said in his post that while the district did what it could to raise his pay, his new salary shows that more needs to be done. Daniel Scarpinato, spokesman for Ducey, said the governor is “very pleased” with how school districts are planning to spend the additional funding. Nearly every school district proposal unveiled so far includes pay bumps for school employees beyond teachers. The proposed increases for these employees — including school administrators and classified employees who make less than teachers — vary between 1 percent and 10 percent. Maricopa Unified School District in Pinal County, for example, plans to give its bus drivers and mechanics 10 percent pay increases to address a shortage of bus drivers and 5 percent increases to the rest of its classified staff. Teachers are slated to receive 10 percent raises. Classified and administrative staff in Phoenix’s Madison Elementary School District are expected to receive 9 percent increases. None of the school budget plans announced so far call for boosting support staff pay at a higher rate than what is being proposed for teachers. Competitive pay for support staff, such as paraprofessionals, cafeteria workers, aides and bus drivers, was one of the Arizona Educators United group’s five demands. 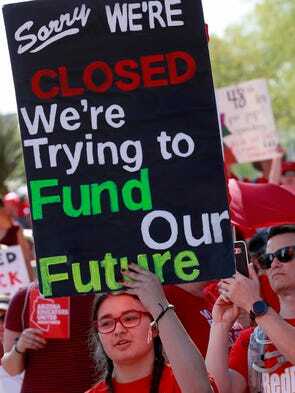 After Ducey announced his #20by2020 proposal April 12, #RedForEd organizers criticized the plan in part because it did not earmark money for these school employees who also participated in the walkout. Beyond teacher pay, much of the messaging around the teacher walkout was about shining a spotlight on low wages for support staffers and overall poor working and learning conditions in schools. Tom Oviatt, president of the Phoenix Union Classified Employees Association, said the fact that schools are including support employees in their raise plans is “probably one of the best things that could happen” and validated their support for a walkout. 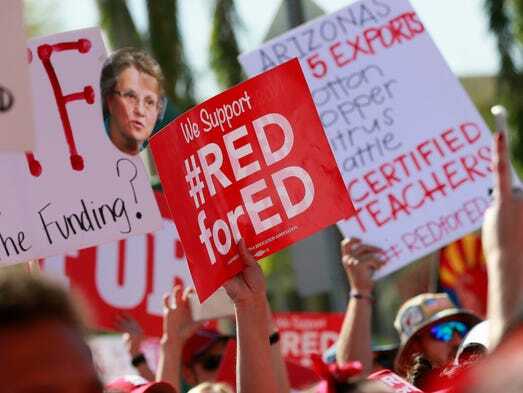 Schools’ pay plans appear to be crafted in response to #RedForEd demands to include support staff, pressure from the governor and Legislature to focus on teachers, and a persisting desire from the parents and the public to see tangible progress in teacher pay. There is not enough money to go around to address everything schools say they need. The state budget also included about $95 million in capital funding, known as District Additional Assistance, one of the pots of school funding that endured the steepest cuts after the recession. Schools are free to spend the capital funding as they want, although it is intended to pay for textbooks, technology, school buses and maintenance repairs. Districts are still receiving about 70 percent less in capital funding from the state than in 2008, according to Essigs. A lawsuit over the state’s under-funding of school capital needs is pending. Several school districts are funneling some or all of that new capital funding toward teacher and staff pay raises. Posted in Advocacy, Education Budget, Every Student Succeeds Act, Failing Schools, Funding For Education, Pension & Salary, Students and Parents Protest. Bookmark the permalink.